Add some heat to your day with succulent Jerk Chicken. 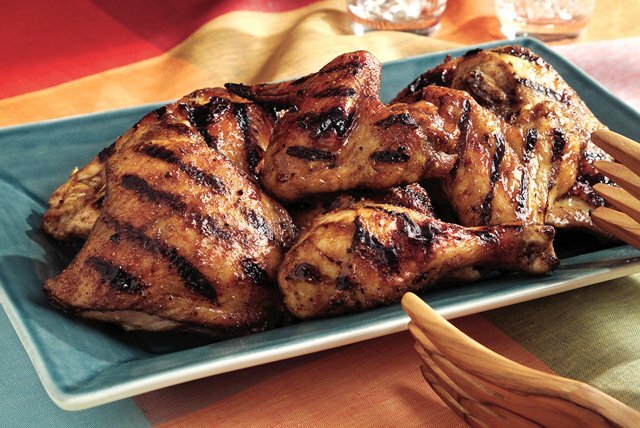 The Caribbean-inspired marinade for Jerk Chicken is flavored with cinnamon and ground red pepper. Mix all ingredients except chicken in large shallow dish until well blended. Add chicken; turn over to evenly coat both sides. Cover and refrigerate 1 hour to marinate. Drain; discard marinade. Preheat greased grill to medium heat. Grill chicken 40 to 45 minutes or until cooked through, turning frequently. Serve with ½ cup of your favorite cooked pasta and ½ cup of sautéed vegetables to round out the meal. Prepare as directed, using 1-1/2 lb. boneless skinless chicken breasts and decrease the grilling time to 20 to 25 minutes. Always cook chicken until no longer pink in the center. The internal temperature should reach between 175°F and 180°F. To visually check for doneness, pierce chicken with a fork. The juices should run clear when the fork is inserted with ease. Marinate chicken as directed. Preheat broiler. Place chicken on greased rack of broiler pan. Broil, 5 to 7 inches from heat, 40 to 45 minutes or until chicken is cooked through.